Solar cooling takes advantage of the sun when it is most needed - During the hot summer months! 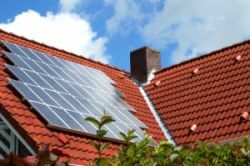 There are three basic approaches to solar cooling that you can apply to your home. 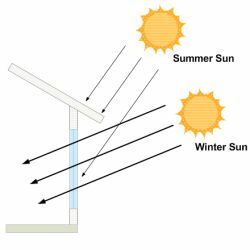 The first is passive cooling, which uses passive solar design techniques to minimize the impact the summer sun has on your home. The next two approaches, solar thermal cooling and photovoltaic cooling, convert solar energy into heat or electricity for use in a cooling appliance. These two approaches take advantage of the high solar intensity on hot days, which is when cooling is most needed, to provide the energy needed to power the cooling device. Passive cooling uses passive solar design principles to reduce or eliminate your home's need for mechanical cooling systems. By incorporating passive solar design principles into your home's design and landscaping, your home will be naturally comfortable and you will have lower energy bills. Solar Desiccant Cooling doesn't really cool the air, it removes moisture from the air which decreases the relative humidity. The moisture is removed by passing the air through a material called a desiccant. As the desiccant absorbs the moisture from the air, it becomes saturated and loses it's ability to continue absorbing moisture. At this point, the desiccant is then regenerated, or dried, with solar heat which evaporates the moisture into the outside air. It is then ready to absorb more moisture from the air entering your home. Photovoltaic cooling uses PV panels to generate solar electricity to power an electrical cooling device. A PV system uses an inverter to convert the DC-power generated by the PV panels into AC-power. The AC-power provides the electricity to power a conventional air conditioner. There are even some air conditioners that can be powered directly with DC-power. In those cases there isn't a need for an inverter! Photovoltaic cooling can also be used to cool your attic. Using a photovoltaic solar attic fan or solar roof vents, you can improve the ventilation in your attic by increasing the air circulation through the area. 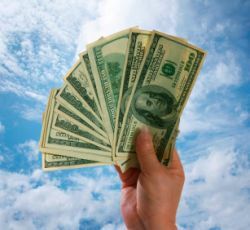 By cooling your attic you will reduce your home's overall cooling expenses. During the summer when the sun's intensity is the strongest, it makes sense to harness that power and use it for cooling. 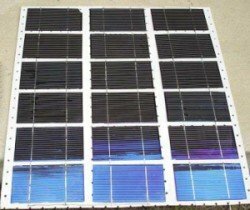 Whether using passive solar cooling to reduce the sun's impact on your home, solar thermal energy for solar absorption cooling or desiccant cooling, or PV panels to power conventional air conditioners, using a solar cooling system to keep your home cool during the hot summer months makes a lot of sense.